We're always trying to think of clever, engaging ways of both raising money and increasing awareness of our company and our work. I think the secret to both in this brave new world is crowd-sourcing, but we're all still figuring out the terrain in this new Information Age. 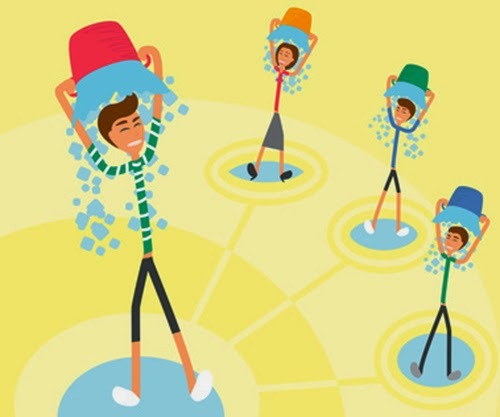 After the ALS Ice Bucket Challenge dominated Facebook for so long, I started thinking about what we could learn from that. Obviously we'd never pull off anything on that scale, but why did it work? Mostly because it was a good cause, I think, and because it momentarily satisfied our unquenchable thirst for seeing human humiliation on the internet. Since New Line's cause is less dramatic, I thought the challenge should be something people like doing anyway. And what do theatre people like doing? Performing. Even those of us who aren't performers anymore. And I remembered an interview with Tim Burton that I saw back around the time Edward Scissorhands was released, in which Burton described what he thinks is one of the great crimes of our culture. At a certain age, we tell children that if they don't draw well, they should not draw; and if they don't sing well, they should not sing. Yet drawing and singing are two of the most enjoyable of human pursuits. We all knew that as children, but it's shamed out of most of us at some point. Luckily, most theatre people resisted such shaming. I accept the New Line Theatre Show Tune Challenge [make sure you tag “New Line Theatre” so all our followers see it], and I challenge [insert your lengthy list of tagged friends] to sing a show tune on Facebook within 24 hours (or so) or donate $50 to New Line Theatre, or BOTH! And don’t forget to tag New Line when you make your video. Initially, it didn't ever occur to me that I would have to do this. I'm just the artistic director, after all, not an actor. But then I thought, some people might be a bit hesitant at first to do this, to sing publicly on Facebook, and I should lead the way. Even if it means making an idiot of myself. It's for a good cause. So I did. You'll notice I kept checking the lyric off to the side. Now I remember why it's so hard for actors to put down their scripts in rehearsal. I started by emailing a whole bunch of New Liners, laying out the Challenge, and asking them all to do videos right away, to launch it fairly big, so it would grow quickly. So initially, twelve of us posted videos on the first day. Before it wound down a couple weeks later, forty people had made videos! Not bad for our first time out! posts about "new line theatre show tune challenge"
Now, you shouldn't feel bad if you missed the fun this year. We're gonna try again next November. And in the meantime, you can still make that $50 donation and assuage your guilty conscience. Just click here for info on making a donation. Surely you could use a year-end tax deduction, right? Anyway, I want to thank the dozens of people who participated in our first Challenge! It was such fun seeing all the videos, particularly because a lot of them came from people I don't know. And Long Live the Musical!